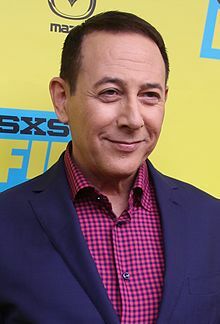 Paul Reubens (born Paul Rubenfeld; August 27, 1952) is an American actor, writer, movie producer, game show host, and comedian, best known for portraying Pee-wee Herman. He is of Jewish descent. He appeared in many movies and television series in the late 1970s and early 1980s and worked with a group called "The Groundlings". Around this time, Reubens created Pee-Wee for a stage show, which was a parody of old kids programs. In 1985, he starred in a movie called Pee-ee's Big Adventure, which was very successful. The next year, he got his own television program, Pee-wee's Playhouse. It was very popular. He was born in Peekskill, New York and grew up in Sarasota, Florida. In 1991, Reubens was arrested for masturbating in an adult movie theatre. This ended the Pee-Wee craze and forced Reubens to stop playing the character. He has since appeared in many other movies and there have been rumors that he would return as Pee-wee. These rumours have not been denied by any official. Episode: "RV Fever/Birthday Boy/Clownfoot/Fred Goes Ape/Flying Mouse/Ghost-sitters"
1980 Steve Martin: Comedy Is Not Pretty Unnamed Terrorist Reubens played an unnamed terrorist that shoplifted nuclear weapons fuel from a convenience store in a skit in this Steve Martin comedy special. 1980 Steve Martin: All Commercials Multiple Roles Reubens played multiple roles in multiple skits in this Steve Martin comedy special. 1982 Madame's Place Pee-Wee Herman Episode: "Episode #1.34"
1988 Sesame Street Pee-wee Herman Episode:"Put Down the Duckie"
2000 Everyone Loves Raymond Russell Episode: "Hackidu"
This page was last changed on 23 November 2018, at 02:47.